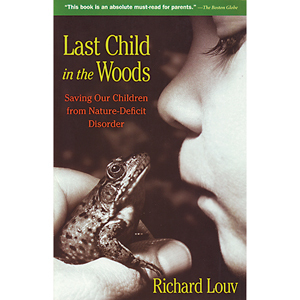 “Why do so many Americans say they want their children to watch less TV, yet continue to expand the opportunities for them to watch it?” Richard Louv asks in his chapter “Why the Young Need Nature.” I believe the same could be asked of our growing interesting in going green. Why do so many Americans say they want their children to learn to take care of the planet, yet continue to prevent them from experiencing the physical world? After explaining how this new relationship between children and nature occurred – growing litigation making it criminal to play outdoors, education trends that marginalize direct experience in nature, as well as the way cities are shaped – Louv moves on to “Why Johnnie and Jeannie Don’t Play Outside Anymore.” He argues that our best intentions are often our biggest hurdles when it comes to kids spending more time outdoors. While Richard Louv does an excellent job of proving that the generalized social anxiety over our fears is unwarranted, I’m not worried about the Bogeyman taking my kids, a copperhead coming to get them, or the West Nile virus for that matter. It’s the ticks I hate. I was doing so well. My kids were clocking numerous green hours over spring break, thanks to the gorgeous weather. That all changed when I woke the other morning to find a tick on my como chiamo, as my family says in Italian slang. I never felt so violated in my whole life. This coming from a woman who returned from a trip down the Amazon River infested with parasites is saying something. So I packed the girls in the car and headed for the concrete jungle. We spent the day tooling around Richmond. I knew when we left the VA Aviation Museum and headed for our favorite thrift store that I was pushing my luck, but the thought of going home and playing inside on a sunny day made me feel so guilty. Still, I was not psychologically ready to subject my private parts to those little suckers again so on we went. When my four-year-old had to remind me through her tears, “Any one of these would have been fun,” I knew I’d gone too far. I moved to a rural community in Virginia because I agree with Richard Louv. Playing outside isn’t simply leisure time. “It’s an essential investment in our kids’ health.” What was the point of having acreage in the woods, if I was going to cart them around the metro area to avoid a nuance? With over 7 million people living in Virginia and only some 900 cases of Lymes Disease reported in 2008, ticks are just that, a nuance. So the next morning, I poured myself some coffee, dusted off the pollen on the porch, and took a seat. I watched my daughters pick dandelions, blowing the seeds into the wind, and thought about how Richard Louv writes “Nature is imperfectly perfect, filled with loose parts and possibilities, with mud and dust, nettles and sky, transcendent hands-on moments and skinned knees.” I knew he was right. Nature is presenting them “with something so much greater than they are” and that reality far outweighs any fear previously holding me back.